Wild on Media got a “Rise” out of Universal Music Canada this past weekend. 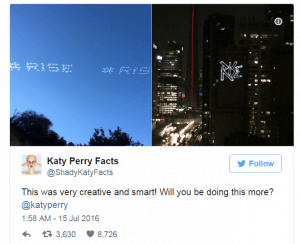 The Toronto company, which specializes in non-traditional marketing platforms – including digital ad trucks, walking billboards, and giant aerial helicopter banners – used a series of laser projections to promote “Rise,” the new Olympic-themed single from Katy Perry. The company projected the word “Rise” onto the city’s Novotel Hotel tower as well as onto the silo visible from the Gardiner Expressway last Thursday. Wild on Media president George Christidis said he had a day to put the campaign together after receiving a call from Universal Music on Wednesday. The Canadian campaign was distinct from a U.S. initiative that saw the word “Rise” featured in skywriting. He said laser projections could be put together on short notice and were capable of garnering huge attention. Christidis said the initiative garnered so much publicity on Twitter – including a tweet from Katy Perry herself – that Universal Music extended its run through Saturday, with “Rise” projected onto a condo building across the street from the Soho Hotel. The campaign coincided with the surprise release of “Rise” on iTunes and Apple Music last week. The pop star recorded the song as the anthem for NBC’s coverage of the upcoming Rio Olympics. The song is currently number one on the Canadians iTunes singles sales chart, while the official video has already garnered more than 13 million views on YouTube. The company has previously used projections to promote Twentieth Century Fox’s Prometheus, as well as campaigns for the environmental organization Greenpeace.